Vine & Leaf Dining Table (Medium or Small). Custom furniture. Vine & Leaf Dining Table (Medium or Small) was inspired by the gardens of Roman villas, especially Villa d’Este. The base takes its shape from that of an urn. The foliage is reminiscent of the vines of Tivoli. The structure of the base is a combination of cast metal framework intertwined with hand-wrought steel vines. Metal casting is done by pouring molten metal into sand molds. The rough casting is then filed carefully by hand. This is a laborious process requiring painstaking attention to detail. The final product receives a multi-layer hand-applied finish. 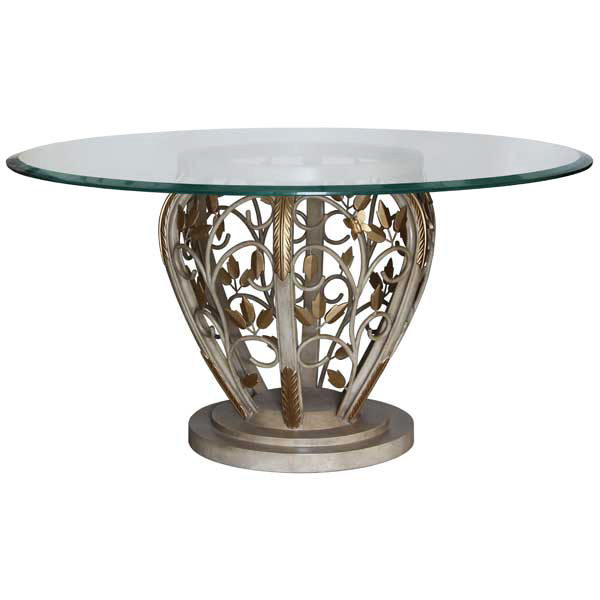 Top options include glass, copper, brass, stone, and wood, up to 60″ in diameter. Exuding European style timeless elegance, it make exceptional dining room table or foyer table for upscale residential and hospitality interiors. Robust metal construction allows the table base to support a heavy top without shaking. The papillon detail on the vine may be deleted upon request. 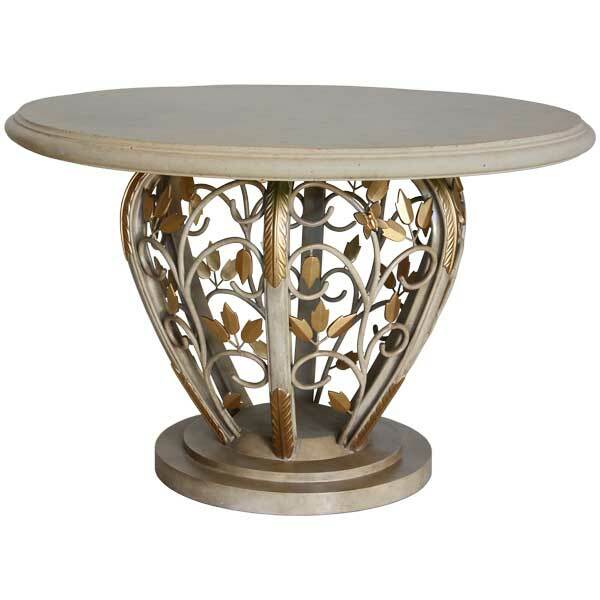 The Vine & Leaf Dining Table Base (Medium or Small) was designed by Shah Gilani, ASFD. It is offered in a variety of finishes and accents. Custom sizing is available.